Before skyscrapers forever transformed the landscape of the modern metropolis, the conveyance that made them possible had to be created. Invented in New York in the 1850s, the elevator became an urban fact of life on both sides of the Atlantic by the early twentieth century. While it may at first glance seem a modest innovation, it had wide-ranging effects, from fundamentally restructuring building design to reinforcing social class hierarchies by moving luxury apartments to upper levels, previously the domain of the lower classes. The cramped elevator cabin itself served as a reflection of life in modern growing cities, as a space of simultaneous intimacy and anonymity, constantly in motion. In this elegant and fascinating book, Andreas Bernard explores how the appearance of this new element changed notions of verticality and urban space. Transforming such landmarks as the Waldorf-Astoria and Ritz Tower in New York, he traces how the elevator quickly took hold in large American cities while gaining much slower acceptance in European cities like Paris and Berlin. Combining technological and architectural history with the literary and cinematic, Bernard opens up new ways of looking at the elevator--as a secular confessional when stalled between floors or as a recurring space in which couples fall in love. 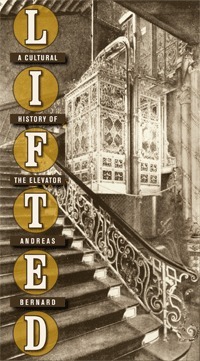 Rising upwards through modernity, Lifted takes the reader on a compelling ride through the history of the elevator. Andreas Bernard is editor of Suddeutsche Zeitung, Germany's largest daily newspaper. He received his Ph.D. in Cultural Sciences from the Bauhaus University Weimar, and teaches cultural studies in Berlin and Lucerne, Switzerland. Lifted is a book about the effect of elevators on our society. The first chapter goes into really the two main inventions that improved the elevator. These were the brake and the electric door connection both made for a drastic reduction in accidents. The only injuries after these were during installation and men not paying attention during repair. The next part of the book talks about how the elevator changes the life of people living in tenement settings and anyone above the fifth floor. People who were either elderly or sick and young mothers having to carry a carriage up and down many flights of stairs would not go outside as much and there for with the stall air and not getting enough sun light they would continue to stay sick or get sick. The elevator allowed people to go out more often and to get out of the stall air that was in these buildings. I found this to be very interesting. After the 1920s and more into the 30s the larger apartments were beginning to be built on the top floors. Before this the bottom two floors had the larger apartments, the more expansive. I have noticed that in some of my travels that some older buildings in San Francisco and New York, for example had stairs not an elevator and because of the age of the building and the size you would not be able to install one. These both being hotels just carrying our bags up three floors was a chore. I can only imagined want it was like at the turn of the century. Towards the end of the book he talks about some of the movies that have an elevator in that is stuck and the people not knowing if they are going to get out start making statements of what they are going to do if they get out. For example, “you got mail”. I thought all of these facts to be very interesting and when he speaks high rises that really took off from the 30s for us, Europe did not start building them steadily until the 50s. over all a very good book. I got this book from net galley.